Gun Fights, Drug Lords And A Thai Lady Covered In Talc! The town hall and another golden Pagoda across from the guesthouse I stayed at in Yangon. My journey through Myanmar had be marred by poor judgement and misinformation resulting in avoidable mental and physical struggle. Although disappointed to learn I had cycled all the way to Yangon for a Thai Visa I didn’t need (G7 countries are exempt for 30 days, don’t expect to find that on the Thai Embassy website though, why would you?) and to cross a border now out of reach, I wasn’t altogether surprised. He Hoe! Despite being in Yangon unnecessarily from a practical perspective, retrospectively, seeing and experiencing the city made it a necessity. The streets were brimming with enterprising vendors selling everything from pigs intestines to high end jewellery, and everything in between. I wasn’t in the market for anything I couldn’t eat and was naturally drawn to the night markets. Thick with stalls of delicious fresh fruit spilling out on to the road, hoards of wide-eyed people J-walking through until unable to resist a purchase. The smell of cooking meet, fish, quails eggs, sweet and savoury pancakes floating in the humid air was almost taste-able. 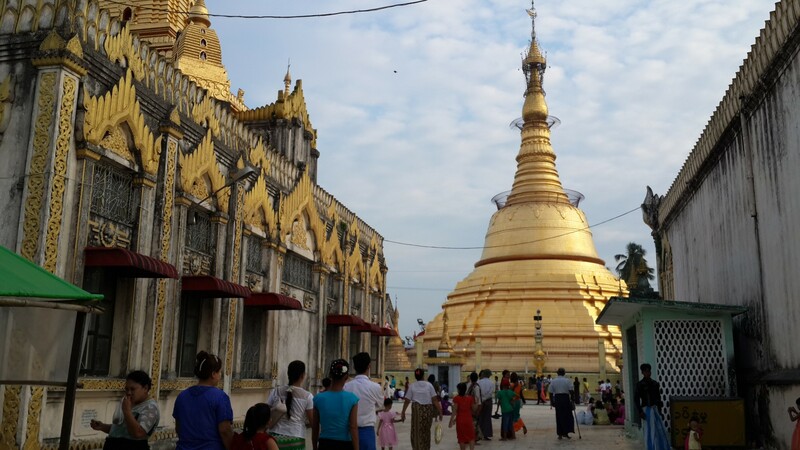 A golden Pagoda in Yangon. Home to many spectacular gold coated Pagodas, although the city was busy, there was an air of peace and calm woven into the fabric of the streets, the buildings and most of all, the people. Faces delicately painted with thanaka (yellowy-white paste made from tree bark to protect the skin from sun burn) every interaction seems to begin with a beaming smile. It’s interesting that as children we laugh on average three-hundred times a day, as adults, only five. What happens between childhood and becoming an adult? As children we have little control or responsibility, as adults the opposite is true. Could it be that control and responsibility stifle our ability to laugh? Or, our perception of what control and responsibility means to us in the context of how we ‘should’ behave and live our lives. I wonder if the people of Myanmar, a country with a long history of military rule, live with a lesser (perceived) burden of control and responsibility because in the past it was taken from them. I don’t know. What I do know is that the people of Myanmar laugh, a lot. A lot more than the people of any other country I’ve passed through. With time running out on my visa, flying from Yangon to Tachileik was the least desirable but safest and most economical way to reach the border with Thailand. I bid farewell to Myanmar with more than a sense of melancholy, a fascinating country home to extraordinary people. Cycling on leaves the past behind once more, the present filled with uncertainty, curiosity and excitement anticipates what each pedal stroke cranks into view. I won’t lie to you, south east Asia was (along with south and central America) THE part of the world I was most looking forward to seeing, and Myanmar, wedged between India and Thailand, an unexpected treat before the main course (like those tasty palate cleansers you get in posh restaurants). After Iran, India, Nepal and Myanmar the first thing that struck me about Thailand was how developed it was: the roads were lined with pavements, buildings were made of bricks and mortar, multinational American franchises were prominent in large towns and cities, as were shopping malls and coffee shops. It was easy to feel instantly at home. 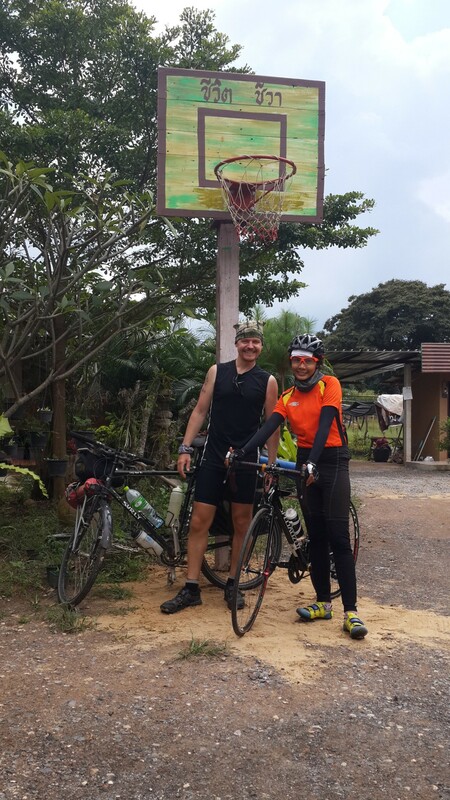 The Spanish cyclist I met between Chiang Rai and Chiang Mai. 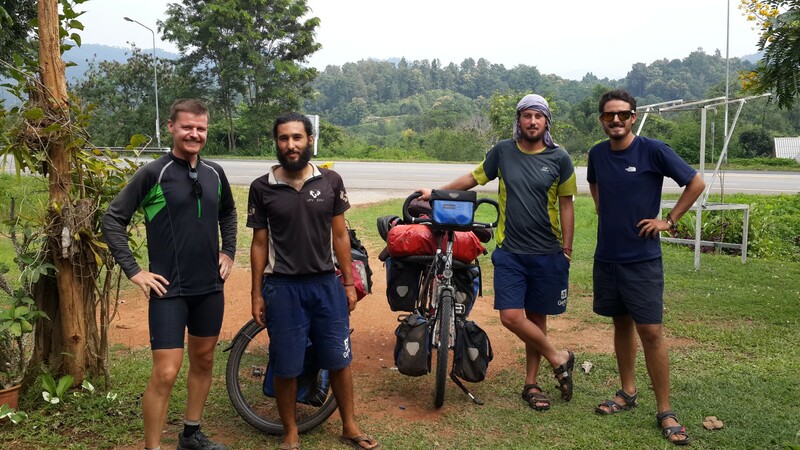 I cycled to Chiang Rai then Chiang Mai meeting three Spanish cyclists on a similar global cycling quest to my own along the way. I spent a week in Chiang Mai catching up with Michael from the Walking The Earth Podcast, and the group of friends he had made during his time living there. It was an indulgent week enjoying free flowing conversation, beer and foods I’ve miss from home: like some of the best hearty British breakfasts I’ve eaten anywhere. It’s easy to understand why people visit Chiang Mai and never leave, it’s just so easy to stay! One of Thailands many golden meditators. 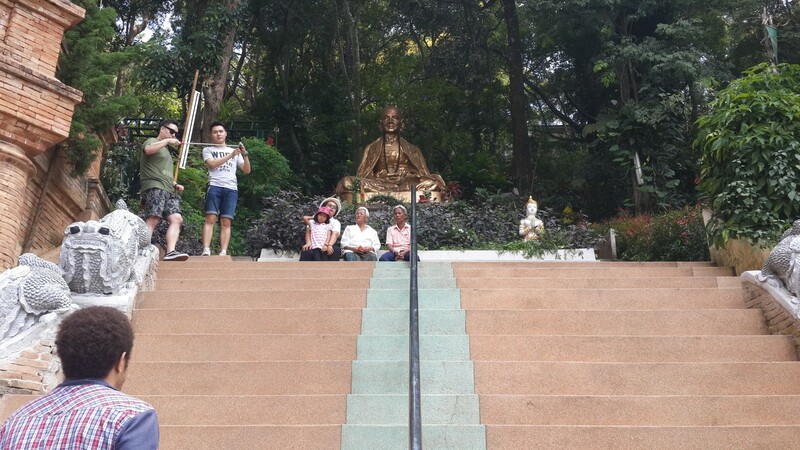 This one was at Wat Phrathat Doi Suthep just outside of Chiang Mai. 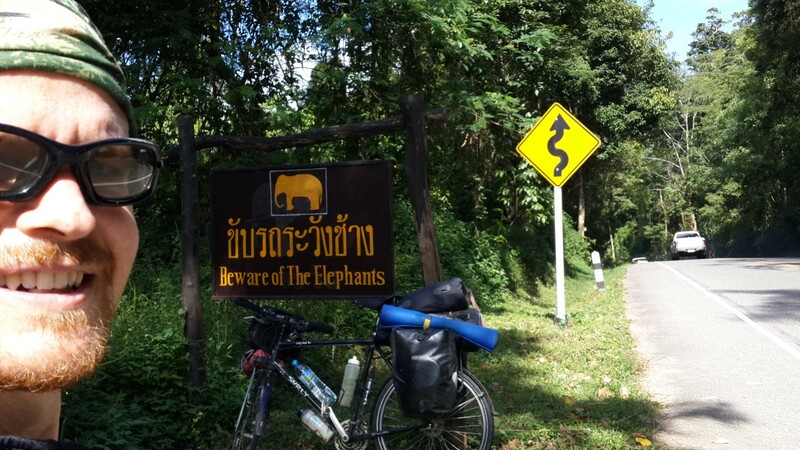 The cycle from Chiang Mai to Vientiane, the capital of Laos, was a whirlwind of burning heat, torrential rain, long flat straights, steep, winding climbs and the fastest descents yet. Through big developed towns and cities to back and beyond villages and national parks, I found myself burnt, soaked, exhausted, stranded, scared, exhilarated, flattered and slightly disturbed! I managed to catch Oh and invited her for lunch. Oh was cycling 150 km to visit her sister, staying the night, then cycling 150 km home. Good work Oh! Walking through Phitsanulok recalling being bitten by a cockroach, and the night market in Uttaradit. Walking through stalls at the night market in Phitsanulok. The stuffed squid which was served with a spicy lime sauce was one of the tastiest things I’ve ever eaten. The base of the sweets was like a pancake with sides containing various toppings, again, absolutely delicious. Why I thought that sea urchins, probably one of the most expensive delicacies, would be sold at a stand in a night market miles away from the sea is beyond me. They were in fact transparent parcels made of rice filled with green vegetables, very tasty but nothing like sea urchins. In the hills between Phitsanulok and Lom Sak. A view from the descent to Lom Sak. A look at the gradients. Breathing through your nose also helps to regulate and slow your breathing down, in turn, slowing your heart beat, too. 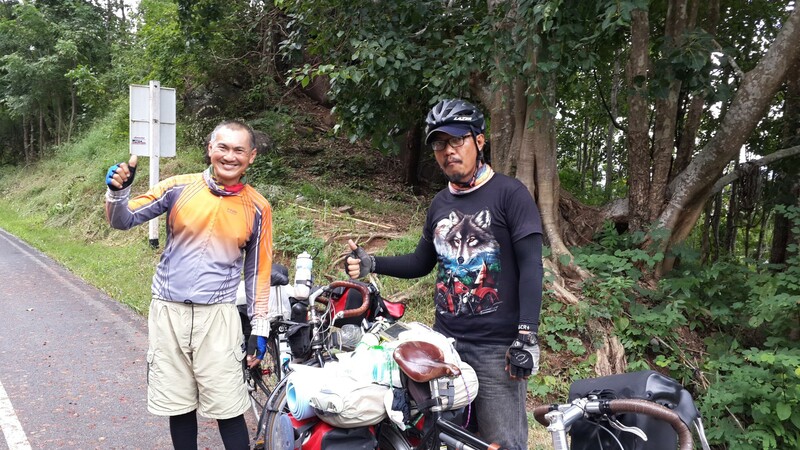 A couple of cyclist from Bangkok I met while cycling through Nam Nao National Park. 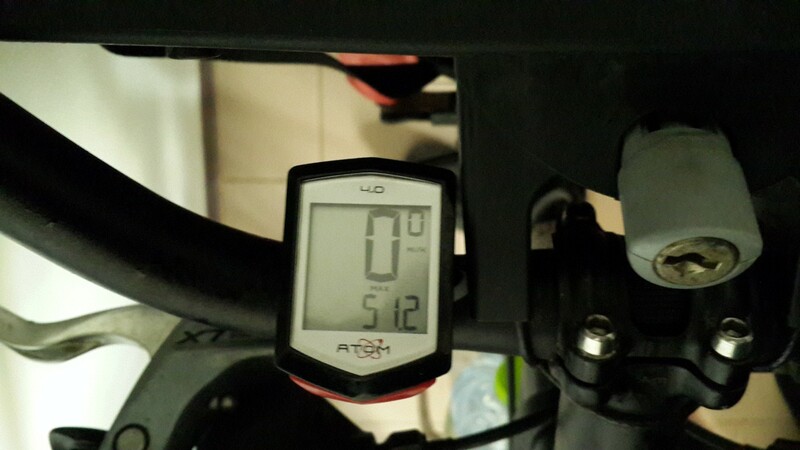 Propositioned by a Thai lady coated in Talc, and a new top speed of 51.2 mph! I write this from Vientiane where I had originally intended to visit a Room to Read school. Sadly the government requires six weeks notice from anyone wishing to do so, a detail we discovered too late to make the site visit on 14th November. The good news is that Room to Read won the World Children’s Prize. An annual prize awarded by children in recognition of an extraordinary contribution in support of children’s rights. It is a huge honor and very well deserved, you can learn about the World Children’s Prize and read about John Wood accepting the prize here. It is impossible for me to get a three month visa for Vietnam from the Embassy in Vientiane, only one month is available, which isn’t long enough to cycle down the coast of Vietnam as originally planned. Instead I will be travelling south through Laos and Cambodia eventually reaching Ho Chi Minh City, Vietnam, to meet the old dears on the first of January 2015. How exciting!! So pleased the old dears are coming to give you a cuddle soon. Please contact to me when you come to Ho Chi Minh City, Viet Nam. Save and Sound for your journey. Sent you an email earlier today, should be in HCM mid December.